There are very few plants that capture our imagination quite like orchids do. They combine stunning elegance and beauty and bring style into the home unlike any other houseplant. There are many different varieties of orchids, some of which have spent years growing in remote locations that have allowed them to evolve into unique beauties. Their fragility and beauty often lead us to be a little anxious when the time comes to bring them home. We couldn’t be happier to assure you that there’s no need to think of your orchid like a work of art that is too delicate to touch. They’re surprisingly easy for anyone to care for, which means they can be suitable for any home. Orchids are part of one of the most diverse families in the plant kingdom, and some of their exotic varieties are downright stunning. However, while there are tons that thrive in their home habitat, only a select few orchids can easily make the jump to being hybridized houseplants. While they share a lot of the features of their wild orchid family members, these orchids are meant to thrive indoors, making them a reasonable plant to introduce to your home decor. 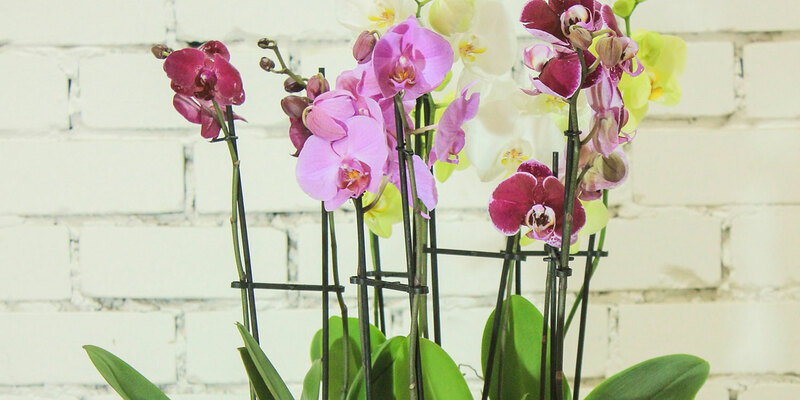 Our favorite and one of the most popular domestic orchid species is the Phalaenopsis orchid, often nicknamed the Moth Orchid for its characteristically wing-shaped leaves. These orchids are graceful, stylish, and offer a look that simply can’t be achieved with other blooming houseplants. While they are actually simple to grow, they’re often sold with their long-lasting, eye-catching blooms ready to capture the attention of anyone that passes them by. These orchids are among the most popular in North America. Homeowners have fallen in love with their long-lasting blooms, complemented with surprising ease of care. Unlike some other orchids that earn the whole orchid family a reputation for being finicky, moth orchids will grace your home with flowers for a few months – at the very least. Starting Out: A beautiful orchid starts right in the store when you purchase a plant that is healthy and ready to thrive in your home. Our healthy orchids show their growing spirit with stiff, dark green leaves and air roots with light green tips. We credit our orchids’ good health to our dedication to growing our plants properly from the start and never cutting corners. General Care: Moth orchids don’t have to be intimidating. Never let their planting medium (they prefer moss or bark) dry out completely before watering – but when you do water, usually once a week, soak the plant thoroughly with room temperature water and make sure it has drained properly before placing it back in its place. This isn’t difficult and is infrequent enough that it doesn’t feel like a chore, but doing it right is the best way to care for your flowers and see the best results. The native home of these orchids is in the jungles of Asia and Australia, so you can imagine what their preferred conditions are. High up in the branches of a humid and steamy jungle, these plants are used to indirect light, comfortable temperatures, and good drainage. Humidity is also very important for healthy orchids, along with good airflow. To keep humidity between 50-80%, set the plants on a tray of gravel partially filled with water. Choose a spot in your home that gets indirect light, at least a foot away from windows, and keep them at a temperature between 75-85 degrees during the day, and 60 degrees at night. For bark-based medium, fertilize with high nitrogen orchid food twice a month, and then to encourage flowering in the winter, use high phosphorus fertilizer, such as 10-30-20. 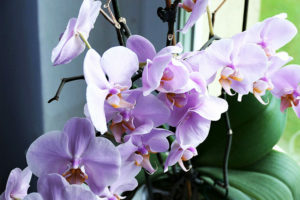 Many people bring an orchid home expecting blooms for a week and being delighted with blooms that last a whole year. Choosing a flower with lots of buds helps to have a successful blooming season when you bring your orchid home. 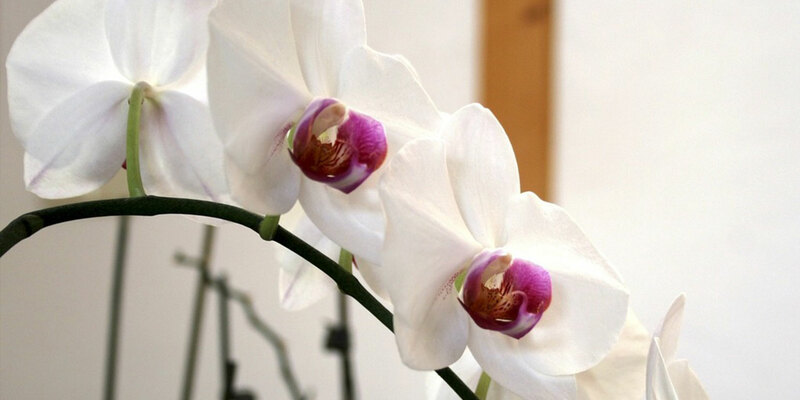 Moth orchids typically bloom from late winter into spring. To encourage flowering, reduce nighttime temperatures to 55 degrees for several weeks in autumn, which helps initiate flower spikes. When it’s done blooming, though, don’t get hasty cutting off the flower spike if you want to encourage your plant to bloom again. When your orchid has finished blooming, cut it just above the highest joint in the spike (called a node), and you can usually encourage the plant to spike again. You can get new blooms on the same spike twice or sometimes even three times, giving your home double the joy for almost no investment. 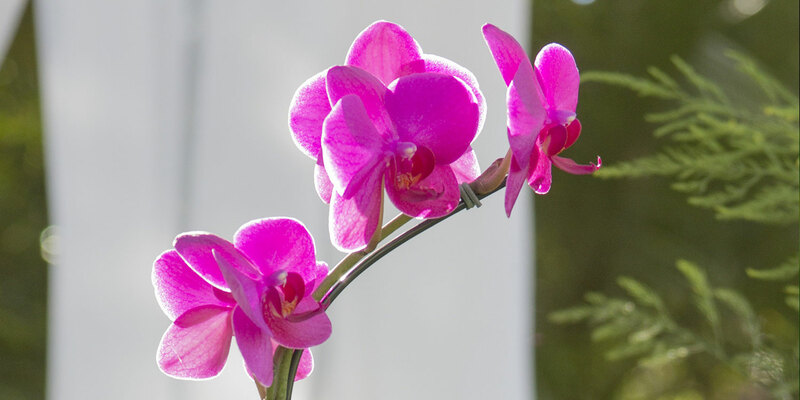 To get an orchid to re-bloom, you might need to encourage the plant with a bit more of a temperature swing between day and night, to mimic the seasonal changes it expects from the wild. A small change of a few degrees warmer in the day and cooler at night could be all you need to see some more spectacular flowers. Orchids have a reputation for being difficult flowers meant for only the most attentive gardeners, but they are actually a possibility for almost anyone. While you can bring home all the prestige and beauty that comes with orchids, you don’t have to bring home the headache. Enjoy your own, and transform your space with elegance and grace.